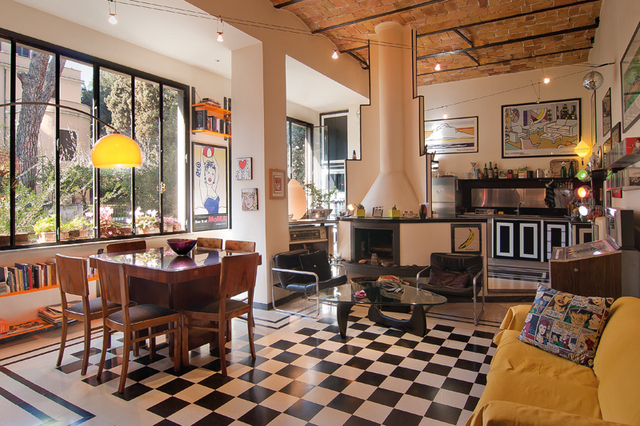 The Bed & Breakfast IL BOOM is in a large apartment (where owners’ family lives) located on the attic floor and penthouse of an early 20th-century building, without lift/elevator, offering a breathtaking view over Rome. Up to 2005 this apartment has been just our home. We restored it with our taste and passion for the three decades (fifthies, sixthies, seventhies) when Rome and Italy made progress and opened up to the world and culture. We tried to save what we could (vintage floors, ceilings, doors, full-lenght window), and mantain the roman atmosphere of our place. One of the unique feature of our apartment are the two splendid terraces, equipped with deck-chairs and umbrellas, where guests can sunbathe and enjoy the romantic atmosphere of the Eternal City. On-site amenities furthermore include a comfortable lounge/kitchen, a PC with internet access, and wireless Internet access throughout the apartment. 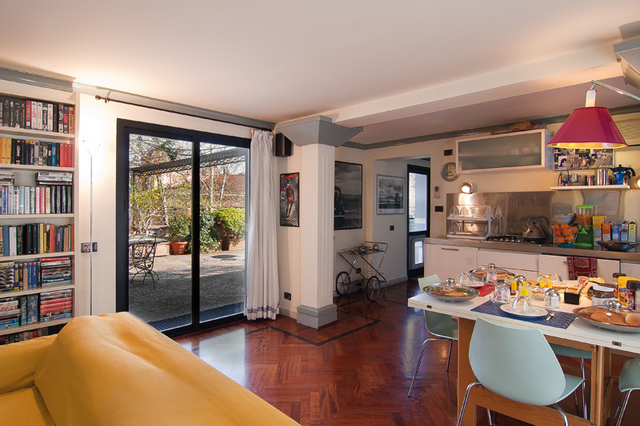 The Bed and Breakfast IL BOOM enjoys an excellent position in the heart of Rome, on the legendary Gianicolo Hill, along a beautiful tree-lined avenue in the charming Trastevere district, one of the city's most ancient and picturesque neighbourhoods. We are located in a quiet and secluded residential area, at a few minutes walking from the most important artistic, archeological, cultural sites of the city. Vatican City is just accross Gianicolo Hill (half an hour walking through Fontanone - a monumental fountain - and Piazza Garibaldi - the most beautiful view of the city. Campo de Fiori, Piazza Farnese, Piazza Navona, Pantheon, Tiber Island, Campidoglio, all the historical center is just under our place. 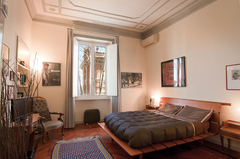 The Bed and Breakfast Il Boom offers 3 spacious double guest rooms (Loren, Magnani and Vitti), each featuring an elegant private bathroom and ample wardrobes. 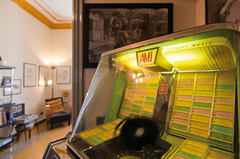 Individually decorated in an attractive 50's, 60's and 70's style, the rooms are named after three famous Italian movie stars of that period: Anna Magnani, Sophia Loren and Monica Vitti. Each room is large and very lighty, with high plastered ceiling. 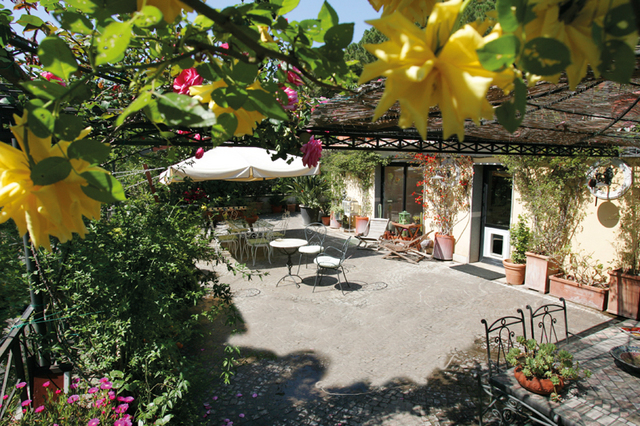 Room Loren is the quietest one because it gives onto Villa Sciarra (a small public park) and nearby gardens. It features a small private en-suite bathroom with shower, and a flat screen TV. 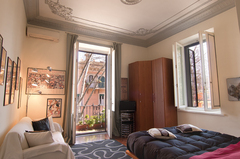 Room Magnani has a window with a wonderful view over Rome. 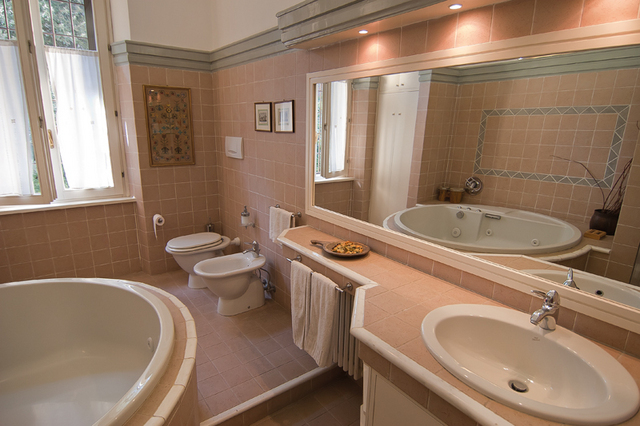 It features an external (just in front of the room itself) very large private bathroom with large jacuzzi bathtub and shower. It has a flat screen TV. A single bed can be added. Room Vitti has a balcony and a window with a wonderful view over Rome. It features an external (just outside the room itself) private black & white bathroom with shower. It has a flt screen TV, and a double sofa bed. All accommodations are strictly non-smoking and equipped with indipendent air conditioning, centralized heating, hair dryer, and wireless Internet connection. A delicious self-service continental breakfast, with home-made cakes and biscuits, toasts, jam, yogurth, fruit juice, milk, tea and coffee, is at guests' disposal in the kitchen. Breakfast can be enjoyed in the dining area or on the outdoor terrace, whenever you prefer, at any time until 1 p.m. Check In/Check Out : Check-in: 2.00pm. if the rooms are available check-in can be earlier, and in any case it is possible to leave the luggage. It is necessary to communicate the arrival time in advance. What to see & do : We are in the historical center of Rome. From the Grande Raccordo Anulare ring-road, take the Aurelia exit and follow the indications to Roma centro and Città del Vaticano. Proceed until you reach Largo Tommaso Perassi and turn right onto Via Aurelia Antica. Continue straight for about 3.5 km/2.2 miles, go past Largo Don Guanella and the walls of Villa Doria Pamphili. At the San Pancrazio arch, turn right onto Via Giacinto Carini. At the first traffic light, turn left, go past Villa Sciarra and proceed straight to Via Calandrelli. Then turn finally right onto Via Dandolo. From the Termini railway station take the bus line n. 75 and get off at the second stop on Via Dandolo. The Roma Fiumicino airport is connected to the city by highway or local train service that stops at the Trastevere station or at Termini station. A taxi flat fare (40Euro) has been agreed with Rome Administration. The Roma Ciampino airport is just a few bus stops from the Anagnina underground station (line A). A shuttle to Termini station is available. A taxi flat fare (30Euro) has been agreed with Rome Administration. 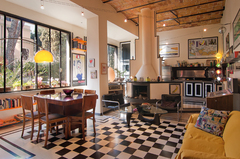 Magnani is a large (18 squared meters)and lighty room, with a high stuccoed ceiling, and parquet on the floor. It has a windows with a view over Rome. Thank you Angelo! next time we come to roma we will stay with you again! and whenever anyone i know needs a place to stay in rome i recommend you! Il Boom was amazing Angelo, you were a perfect host and the terrace was just fabulous, and yes of course I will put a comment on trip advisor for you, we look at the comments all the time so yes I think it is very important we do this for you. Dear Angelo We really enjoyed our stay at your place in Rome. The whole idea with your B&B is great; we felt like we were staying in a hotel but at the same time in somebody's home. Breakfast was great with the large number of choices. I will go into tripadvisor and recommend il boom asap. Angelo, I was also sorry that I didn't get to say goodbye and thank you personally for my wonderful stay. I'm definitely going to recomend Il Boom to others, and hope to stay there in the future. Hi Angelo, It's nice to hear from you! We had a great time in Rome and it was a lovely city to end our honeymoon! We loved the B&B and how personal the place was to your individual taste - you have a beautiful home! I will post a review on Tripadvisor...it is where we found you in the first place! Dear Angelo I have just finished my opinion of your B&B in tripadviser. As you know we were very pleased with our stay at your flat and we hope we can return some day. Angelo, Thank you for your hospitality and help during our stay in Rome. My wife and I had a wonderful time and enjoyed staying at your bed and breakfast. We will definitely recommend your place to any friends who may travel to Roma in the future. I will post a review on Trip Advisor as well.